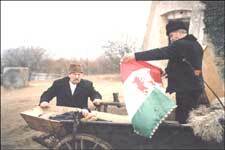 The Other Person (Part I) - A Hungarian Film By Ferenc Kosa is an event that took place between 30-Apr-2004 and 25-Apr-2006 in Hyderabad. Who are the real heroes? The first part of The Other Person takes place in the fall of 1944; and the second part, in the fall of 1956. The two seemingly independent stories complement and shed light on each other. In the fall of 1944, Antal Bojtar tries to flee the hell of World War II. His troops are surrounded and wiped out by Ukranian partisans. Bojter and his friend Jozsef Torda miraculously escape, but history hurls them into another trap. They are captured by Hungarian fascists, who sentence the two tortured soldiers to death, as deserters. The price of their freedom would be to accept the help of a half-mad, arrow-cross officer, who recruits soldiers "to protect the nation". For a moment the fates of the two soldiers part here - one will become the tool of the arrow-cross officer as a consequence of this helplessness; the other, Bojtar, turns against the "savior of the nation", attempts to kill him, and then tries to hide with his family at home, in a farm in the Great Plain. At the end of the first part, both soldiers - Torda, who has become a traitor and Bojtar who turns against his fate - become victims. The Other Person (Part I) will be screened at Sri Sarathi Studios, on the 30th of April, at 5 pm. The film is directed by Ferenc Kosa. The cast includes Ferenc Bessenyei, Csaba Jakab, Anna Rackevei, Zoltan Varga and Zsolt Szerenyi. Be the first to comment on The Other Person (Part I) - A Hungarian Film By Ferenc Kosa! Just use the simple form below. fullhyd.com has 700,000+ monthly visits. Tell Hyderabad what you feel about The Other Person (Part I) - A Hungarian Film By Ferenc Kosa!